These Pulled Pork Nachos are an appetizer favorite around here, besides that they are packed with flavor and pull together in minutes! Pulled Pork Nachos are a family favorite around here. We like to slow cook pulled pork and serve it when we have guests. You never want to be that family that hosts a party and runs out of food, right? So we generally overdo it in the pulled pork cooking category and therefore, have quite a bit left over. What do we do with it all? The great news for us is that we love the stuff and we have found several ways to cook the leftovers. We freeze the rest and space it out. One of our favorites is BBQ Pulled Pork Nachos. This is one of those recipes that has evolved after having a heaping pile of leftover pulled pork. The whole pulled pork nacho recipe pulls together in just a few minutes. Check out our favorite Oven Roasted Pulled Pork if you need an easy and delicious recipe. If you don’t have leftover pulled pork at the ready you can use the recipe above, or you can buy it at the store already pulled. Either way, you are going to love this unique spin on regular nachos! The true key to making the best Pulled Pork Nachos is layering so it seems like we should talk about that first. We’ve all been to that restaurant and ordered the Nachos only to find that all of the good stuff is on top. All it takes is one selfish chip grabber to nab all the bait, leaving only dry chips and a few sparse shreds of semi-melted cheese. Layering is the most important tactic in creating the perfect nacho platter. 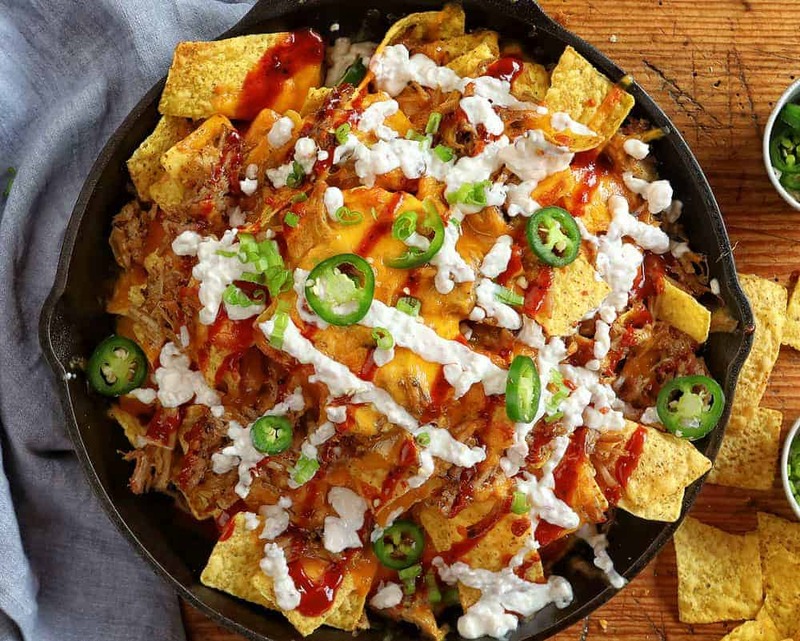 For this recipe, you are going to bake the nachos in a skillet and work on perfecting uniform cheese and pulled pork placement. Repeat after me, chips, cheese, pulled pork, chips, cheese, pulled pork. You get the idea right? Once you have used up all of your chips, throw a heaping pile of cheese and pulled pork on top and pop the entire skillet into the oven. After the dish has cooked through, the magic happens. The most important ingredients go on top, BBQ Sauce and our White Sauce. No dollops, that is how to selfish chip grabbers get away with it. If you have one, use a piping bag (or a ziplock bag with the tip cut off) to make a criss-cross or zig-zag pattern on top, that way everyone gets a bit of the good stuff. Our favorite BBQ sauce has a good mix of spicy and tangy, but you can choose your favorite BBQ Sauce for this recipe. 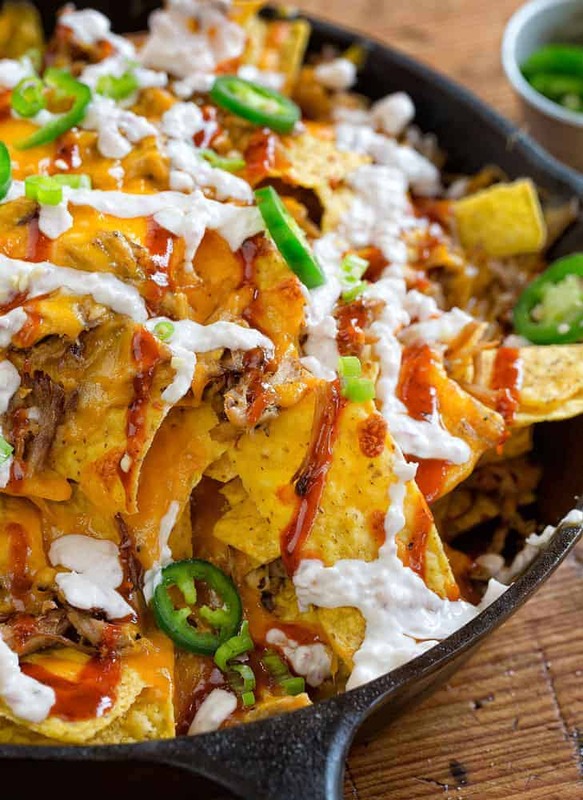 The thing that really drives this pulled pork nacho recipe home for me is our white sauce. We blend together mayo, sour cream, garlic, and minced red onion. You could use this sauce on pulled pork sandwiches, over a hot dog, or in potato salad, because, why not? It is loaded with flavor and you will find that it adds a bit of a zing to any dish! 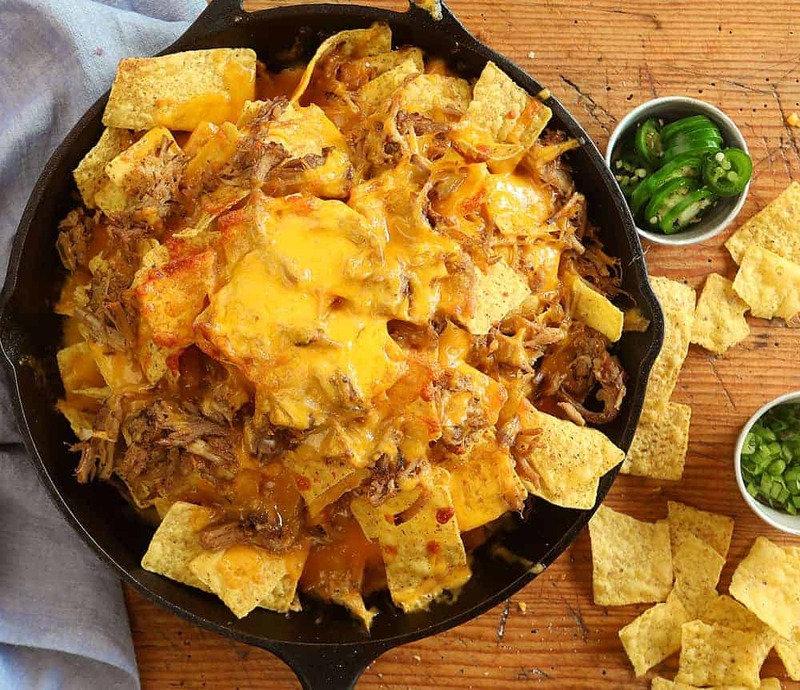 For this BBQ pulled pork nacho recipe, we used cheddar cheese, but you could swap that out with pepper jack or Monterey, or all three! Alternatively, you could add mozzarella or colby cheese. You will want to stay away from cheese that doesn’t melt well. Additionally, you could add jalapeno, cilantro, corn, black beans, tomatoes, red or green pepper, and red onion. I just love a heaping tray of loaded nachos, so naturally, I think you will too! During football season, we like to leave a tray out with all of the fixings in separate little bowls so people can decide for themselves how much of each thing to add. It makes a great appetizer and you probably won’t have any leftovers! 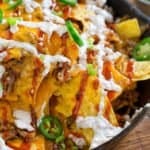 Want to make these Nachos but don’t have any pulled pork on hand? You can use steak bites or hamburger! Looking for other appetizer recipes? In a large skillet, place a thin layer of tortilla chips, top with 1/4 of cheese and 1/4 of pork. Place skillet in oven for 15 minutes or until cheese is melted and bubbly. Drizzle with BBQ sauce and white sauce. Top with jalapenos, serve immediately. The most important tool you will need for this recipe is a skillet. I like to use the biggest one I have which is a 12 inch cast iron skillet but you can get them even bigger. If you don’t have one that large, a smaller skillet will work similarly but make sure to set your oven racks low enough so that the entire dish will fit in your oven! DID YOU MAKE Pulled Pork Nachos? Hmmm yum! 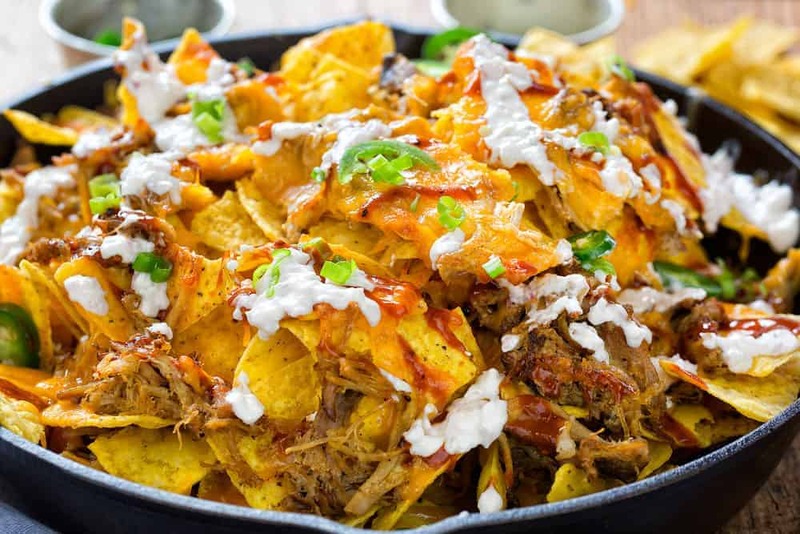 These Pulled Pork Nachos look soooo delicious! 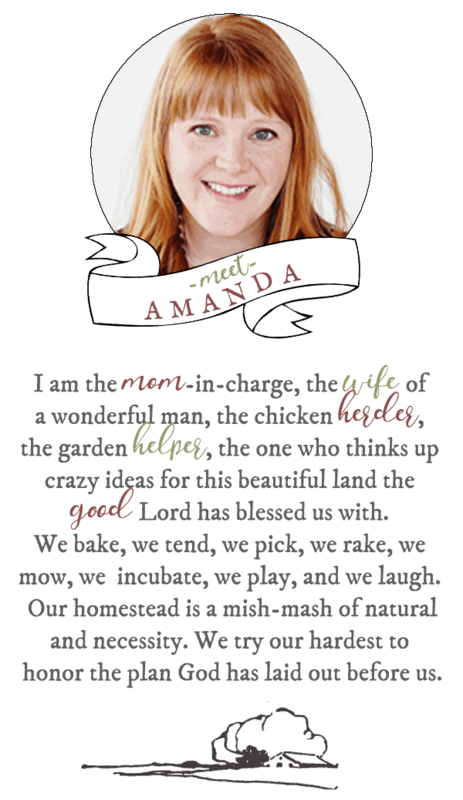 Can’t wait to make this for the family.